In addition, the interaction between the calcium and other components in milk confer specific health effects. Dairy products represent a unique source of nutrients and bioactive components that act synergistically as well as independently. It is an integrated food system of structure­specific proteins, lipids and carbohydrates that have beneficial physiological properties beyond the content of essential vitamins, minerals and macronutrients. To enjoy the health benefits of dairy, three servings are recommended as part of a daily diet. A serving size of dairy is calculated to provide 300 mg of calcium per serving. Combining three servings of dairy per day will help you to achieve at least 900 mg of the recommended daily requirements of calcium. The average daily requirement of calcium for individuals four years and older is between 1000 and 1300 mg/day, which is based on the Dietary Reference Intake (DRI). 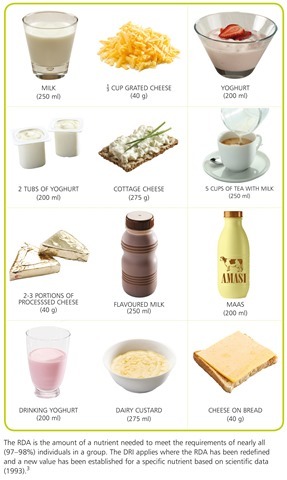 If you favour only one dairy product, make sure you get at least three servings of your favourite product every day. The RDA is the amount of a nutrient needed to meet the requirements of nearly all (97–98%) individuals in a group. The DRI applies where the RDA has been redefined and a new value has been established for a specific nutrient based on scientific data (1993). Milk is catagorised according to its fat content. 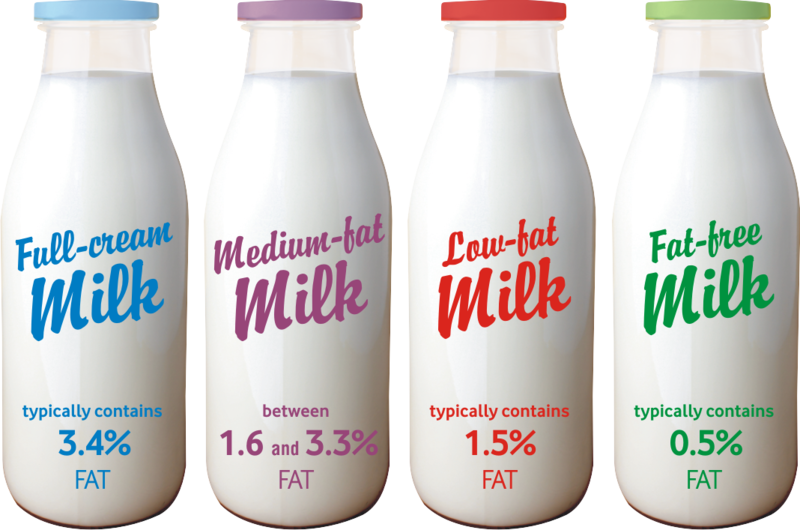 The different types of milk available on the South African market are full-­cream, medium-fat, low-­fat and fat ­free milk. Excess fat in the diet is not recommended; however, the body still needs some fat for cell structure, protection of nerves and to absorb and store fat­soluble vitamins such as vitamin A. When the fat content of milk is reduced (through cream separation or centrifugation), some vitamin A is lost. The content of the water­soluble vitamins and minerals, however, remains unchanged. 1. Miller GD. 2007. Handbook of dairy foods and nutrition. 3rd ed. National Dairy Council. New York. 2. Huth PJ, Direnzo DB. et al. 2006. J Dairy Sci 89: 1207­1221. 3. Mahan KL & Escott­Stump S. 2000. Food, nutrition & diet therapy. 10th ed. WB Saunders. Pennsylvania. 4. Wolmarans P. et al. 2010. 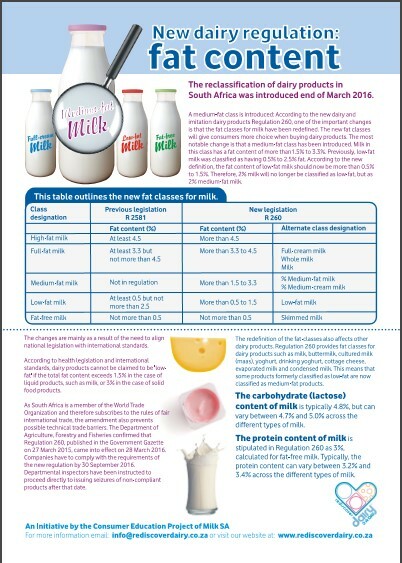 Condensed Food Composition Tables for South Africa. Medical Research Council.Cape Town.